Choose a new Italian topic to learn! 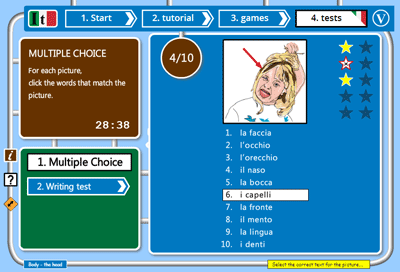 These Italian tests are designed to round off your learning experience here at learn-italian.net by testing whether you can correctly recognize the language you have learned (in the multiple choice test) and that you can correctly write out that language (in the writing test). Make sure you have chosen the correct topic before starting! Although these tests are timed, try to relax and concentrate on getting the answers right at first - later you can try the tests again more quickly. This is a multiple choice activity similar to "What is it" in the Italian tutorials - you are shown a randomly selected picture from the topic you are using. 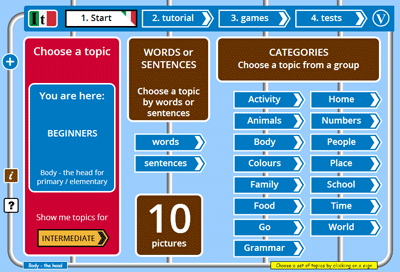 All the topic words are displayed as a list numbered from one to ten. If you roll over any text, you will hear the audio for that vocabulary.